Ok so, sometimes this mama takes short cuts! And it's been more often than not lately because well, life is BUSY! Kids are in soccer, we have life group, Awanas, etc. 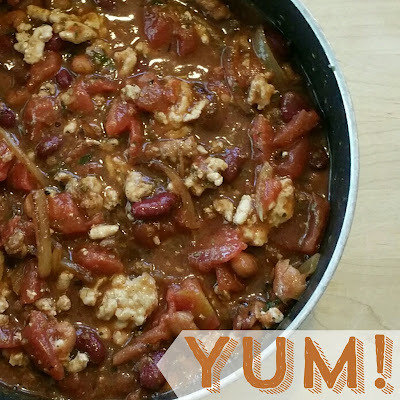 So, the plan today was to make the Fixate chili recipe and have a yummy homemade dinner ready by 5. Well, when I looked up at the clock to start it, it was already almost 4 and I hadn't even started with dinner yet! Lucky for me, I had a plan! It was to make a SEMI-homemade chili instead, cutting my prep time in less than half but still making a pretty clean meal we'd all enjoy! So, here it is! Give it a shot and let me know what you think! 1. Open the chili can and pour it into a sauce pan. 2. Add in 1 can of kidney beans, 1 can of diced tomatoes and sprinkle with seasoning. 3. Set aside and begin cooking your turkey. Place it in a skillet and brown it. When browned, add it to the chili and you're done. 4. You can serve it alone or like I did, on top of spaghetti squash. To make the spaghetti squash, just slice it in half lengthwise (hardest part!) and spray or sprinkle with olive or coconut oil. Then sprinkle your fave seasoning on it ad place it face down on a cookie sheet. Bake it for about 45 min at 375 then take it out, let it cool and scrape out the "spaghetti" with a fork. Here's a video on how to make spaghetti squash if you'd like to check it out! Serve the chili on top of the squash!